Opinion Poll: Which movie have you watched for Diwali? As the lights dimmed in the cinema hall, I wondered how would Action Replayy be like. On the one hand, there’s a director like Vipul Shah who has had three back to back successes as a director – Aankhen, Waqt - The Race Against Time, and Namastey London; and a mixed London Dreams. On the other hand, there’s Akshay Kumar, whose last couple of films have been disasters at the box office, namely Chandni Chowk to China, 8x10 Tasveer, and more recently, Khatta Meetha. But most of us movie buffs do know that Vipul Shah has always concocted a success formula with Kumar, even as producer, with his presentation of Anees Bazmee’s Singh Is Kinng also clicking at the ticket window. Now, Shah is back, and devises an unusual pairing of Kumar with Aishwarya Rai Bachchan, in a movie that promises entertainment, comedy and outstanding performances. With the music of the film doing very well and promotion being rock solid, does this Diwali entertainer succeed in winning the hearts of the audience? 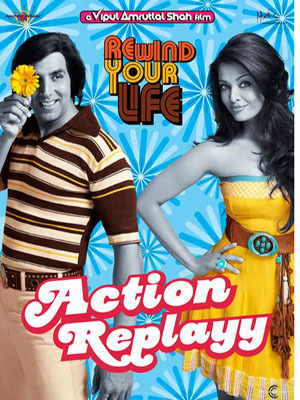 Based on Shobhana Desai’s Gujarati play Action Replay, with very light traces of the 1985 Hollywood success Back to the Future, the movie is about Bunty (Aditya Roy Kapoor), who lives a disillusioned existence as a son of two parents – Kishen (Akshay Kumar) and Mala (Aishwarya Rai Bachchan) – who constantly squabble as a result of an arranged marriage which didn’t work out. This is why he keeps running from Tanya’s (Sudeepa Singh) repeated marriage proposals. One fine day – the day before his parents’ marriage anniversary – she takes him to her grandfather, Anthony Gonsalves’ (Randhir Kapoor) laboratory to convince him about their marriage, which is where Bunty discovers the time machine. After a severe spat between Kishen and Mala, Bunty runs back to the laboratory and steals the machine, going all the way back to 1975, with a mission to make his parents fall in love. Does he succeed? Every movie needs a good story and screenplay, and this one has it all. With a well-penned story by Suresh Nair and Aatish Kapadia (also the writer of Waqt - The Race Against Time and the writer-director of Khichdi: The Movie), who has also supported Vipul Shah in the screenplay department, the movie’s narrative moves at a consistent pace – neither fast, nor slow – and the storytelling is pretty grounded for most of the first half. The comedy isn’t over the top, and ends up generating a bountiful dose of laughs. Kapadia’s dialogues are witty and creative. Direction by Vipul Shah is as usual, excellent. It’s a shame that his last sincere attempt at executing London Dreams was supported by an inconsistent screenplay, but this time, he’s back in form. As good as he is at handling the comic moments, he deftly executes the emotional scenes as well. Technically, the movie tries to get it all right. The movie boasts of terrific production design, with art direction and set design by Aparna Raina and Anisha Gulati respectively. Be it the whole seventies look of Mumbai, or the laboratory, or even the set design for the Holi song – ‘Chhan Ke Mohalla’ – the movie gets it right. Cinematography by Sejal Shah is decent with tightly executed composition of shots, and the camerawork is smooth, supporting Shah’s visual support well. Amitabh Shukla’s edit is really good; especially to the shots in songs like ‘O Bekhabar’ and ‘Zor Ka Jhatka’. Motion Graphics for the opening and closing titles are very impressive. The opening titles deserve special praise for setting a base to the thematic element of the film. Action by Allan Amin suits the theme. Visual effects are decent, but could have worked on a bit more. Sound design and audio post-production has been interestingly executed. The punch sounds as Kumar does his epic Eastwood-meets-Bollywood fight to save Yadav make the scene hilarious and literally transport you to the seventies, making for a decent spoof that’s not loud at all. The background score by Salim and Sulaiman bowl you over, and help in enhancing the varied set of emotions in the film. The music by Pritam is massy and the visuals totally support the songs produced; the notable ones being ‘I’m Dog Gone Crazy’, ‘Zor Ka Jhatka’, ‘O Bekhabar’, and ‘Chhan Ke Mohalla’. Performance-wise, the movie hits bullseye with the casting. I’d like to start off with Aditya Roy Kapoor, who has given a fantabulous performance. This film will take him places, and his rise is inevitable. Akshay Kumar is usually the loudmouth nutcracker or the filthy rich over-excited person who’s usually on a sugar rush. But this time, he’s managed to restrain himself, by becoming an uncomely geek who needs a lot of change in presentation; and how! The best part about his collaborations with Shah is that despite having enough slice of comic timing, he manages to get a variety of roles. Even with his last Namastey London, he played a crushed lover to perfection. Here too, he has done very well, and has brought out a different side of him in a spew of repetitive roles in which the only time he strived to be different was in Blue. Aishwarya Rai Bachchan looks like she’s on a roll! The tomboy role suits her to the T, and post her performance and the imminent success of Enthiran/Robot, it looks like this one’s taken the cake. Neha Dhupia is decent and does the seventies sharmilee act with ease, without making the spoof look loud. Sudeepa Singh is decent in her short role. Randhir Kapoor looks comfortable with his role; in fact with it good to see him on screen. Om Puri and Kirron Kher are hilarious and they handle their roles, however caricature-like, powerfully, which makes it difficult for us to ignore them. Rajpal Yadav is okay – in fact, he’s not funny here, as there are lods of other performers who get the comic timing better off than him. Rannvijay Singh is efficient. What doesn’t work here then? The first half is a tad slow, and quite a few inches of the pre-intermission reels try to develop the character. But no sooner than Kapoor’s character gets transported into the seventies, the laughs, the drama and the fun starts, the movie becomes a ride. The climax too could have been written differently, though there’s nothing wrong with the present climax anyway. Other than that, the minuses are difficult to find. Overall, the movie turns out to be a highly enjoyable romantic comedy with top-notch performances and terrific execution. Akshay Kumar is finally back with a bang in this potentially successful collaboration with Shah. Worth the watch!